National peace and stability is the primary requisite of the steadfast march on the multiparty democracy path in accordance with the public aspiration, the success of the democratic goals and national development endeavours. During the first term of the multiparty democracy system, the government’s reforms prioritized the peace process to end ethnic armed conflicts. It took over four years to sign the NCA on 15 October 2015 as all the armed ethnic groups were invited to the peace negotiations on 18 August 2011. NCA was signed two years ago. Two-year period is not a significant time when compared with the nation’s history. But it is a valuable length of time for emergency issues and matters that need immediate realization. Not only the people at this ceremony, but also the entire nation agree that peace overwhelms every sector of the country as it calls for urgent realization. Warming-up is an essential part to a sports event. We will face unnecessary failures if we enter a sports competition long after the warming up. We need quick action in implementing necessary tasks of NCA to enjoy the results and fruits of peace. 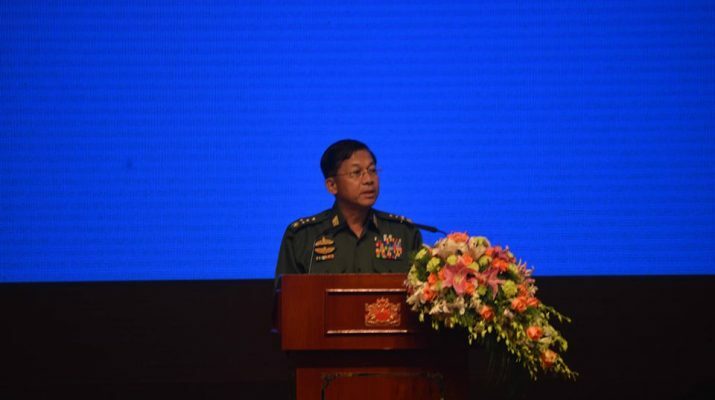 The Tatmadaw is always ready to participate in the peace process with heart and soul. The country started adopting the public-aspired multiparty democracy in 2011. Since it assumed the State duties in 1988, the Tatmadaw government had been carrying out political, economic and social development undertakings till 2010. 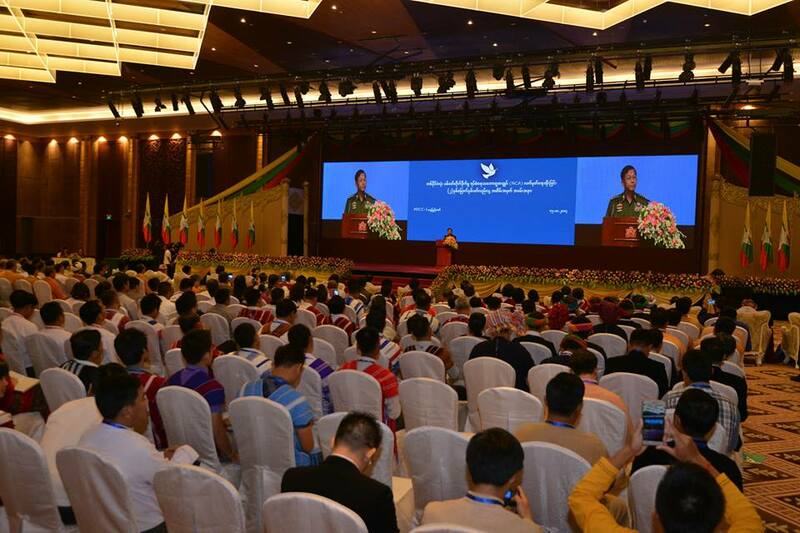 The Tatmadaw government held the National Convention with the involvement of the representatives of all walks of life and all strata of life of the people to adopt a Constitution suitable for a democratic state. The Convention discussed and drew in detail the fundamental principles and the chapters for the Constitution. The Tasks which were compatible with the democracy system were implemented simultaneously. 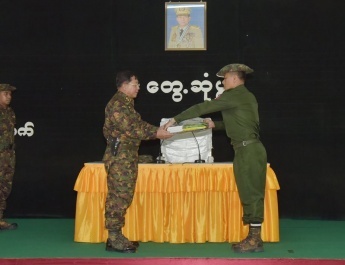 For example, Tatmadaw officers were assigned as chairmen of township and district administrative bodies, but later administrators of the General Administration Department were assigned to the job to build the administrative pillar under democratic system. The task of building the bureaucracy administration was also gradually reformed under the Tatmadaw government. In fact the Tatmadaw government took time in building the institutions that would become vital under democracy. As for the national reforms, it laid down and implemented the seven-step Road Map. Finally it could successfully hold 2010 elections and transfer the state power to the government chosen by the people. In fact the Tatmadaw government realized the people’s aspiration. In addition it took many years for the nation to adopt multiparty democracy system. So everyone and every organization should understand it. The Tatmadaw for its part is making efforts in ensuring that the country continues its path to multi-party democracy in a firm way. It has been over six years since our country started practising multi-party democracy. We can assume that democracy is a system, while others may assume it is a task or an ethic that can achieve success only if it is followed and respected by everyone. Surely, it is a political system that requires inclusive cooperation. In this context, the most fundamental requirement is that we have to stay away from acts that could deviate from the democracy road. In democratic system, we have to make demands in a democratic way and within the framework of law. Only then, will it be in line with the people’s wishes. The main thing is that everyone must act in accord with the law. No one is above the law. Any person or organization must respect the existing laws in carrying out any kind of their duties. The law cannot be abused as a tool. They need to respect the previous promises. Whatever act that is done beyond the law will face criticism. All those living in Myanmar need to respect the existing laws enacted by the State. They must also accept the measures taken in accord with the law. The conflicts we are facing must be resolved within the democracy framework. We have to seek political solutions by putting an end the armed struggle line which is the opposite of the democracy. To do so, signing the NCA is the first step we have to take. The most important thing is to take a first step to reach our destination no matter how far it is. I would like to urge you to take this first step without hesitation towards the journey of lasting peace and the Union based on democracy and federal system that we are all pursuing. History is like a mirror that reflects the strong and weak points and advantages and disadvantages we have gone through throughout our life. Looking in that mirror, we will clearly see that our national brethren have been living in Myanmar through thick and thin since ancient times. Although ours is a country made up of states and regions, each region is not inhabited by only a single ethnic group, and various national races have been residing together in amity in every region. As the saying goes, “Blood is thicker than water,” our history has it that all the people, without discrimination against race or religion, have defended against any aggression with Union spirit. When the unity broke up and the solidarity waned, our country lost its strength to defend, and all the people fell under the colonial rule for over 100 years. With the loss of independence and national sovereignty, the influence and exploitation of the British colonialists became a tragedy for our country and people in history. 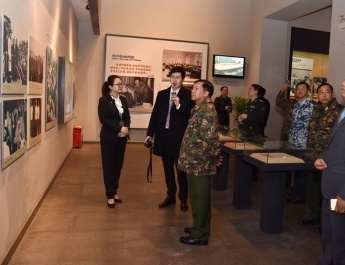 Again in our history, we have unforgettable memories such as the fight against the Japanese fascists and British colonialists with the united strength of the Tatmadaw born together with independence struggles and the people, and a show of national unity based on Union spirit. The divide-and-rule policy handed down by the colonialists in post-independence period led to ideological, racial and religious discord. The armed conflicts we are trying to resolve today are the lessons we have to take from history. The most valuable thing we have extracted from history is Our Three Main National Causes—non-disintegration of the Union, non-disintegration of national solidarity and perpetuation of national sovereignty. This is why I would like to say that Our Three Main National Causes is the national duty our all national people have to safeguard. The Tatmadaw which is mainly discharging State defence duty will always uphold and safeguard Our Three Main National Causes and never accept encroachment on those causes. 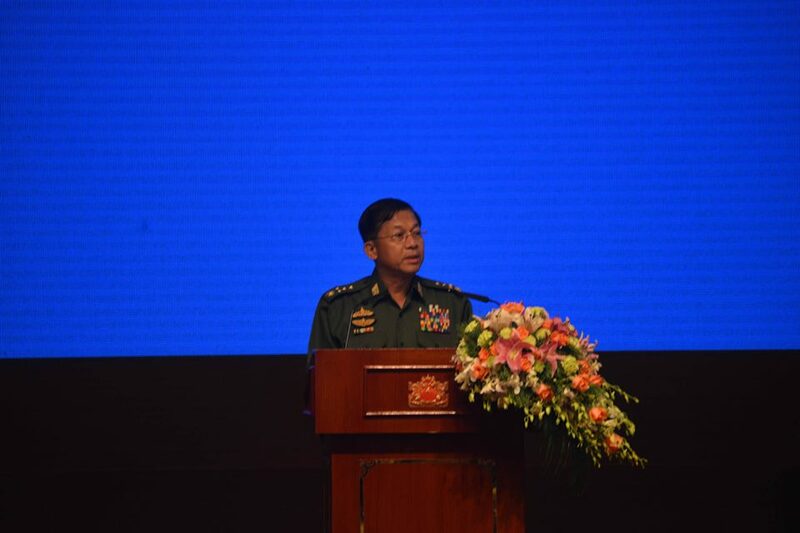 I would like to reiterate as it is a national cause, the entire national people need to cooperate with the Tatmadaw in safeguarding the causes. I have said matters related to NCA at the ceremonies, discussions and meetings concerning the peace. In this regard, I would like to mention the first point that “NCA is the main fundamental fact in the peace process which the country urgently needs,” the second point that “without implementing the fundamental fact or all our peace processes without ending a noise of gunfire may not be rest assure and it may return to armed struggle line,” and the third point that “the NCA was drawn by the government, the Tatmadaw and all armed ethnic organizations based on initial proposals of armed ethnic organizations, not by individual or single organization.” Moreover, it can be found no agreement was signed through coordination with many organizations in the history of Myanmar’s peace processes. So, I would like to note that the NCA was conducted in a democratic way which means agreement of majority and cooperation. As such, cooperation in NCA is hoped for the sake of the State and the people in the peace process which is of great importance for the nation and the people as part of implementing the people’s desire in a democratic way. Firstly, the basic principle of the NCA was agreed “to build the Republic of the Union of Myanmar as the Union based on democracy and federal system in line with the result of the political dialogue with full rights and guarantees of democracy, national equality and self-administration in accord with the Panglong spirit depending on liberty, equality and justice by upholding the non-disintegration of the Union, non-disintegration of national solidarity and perpetuation of sovereignty.” To restore long-term existence of peace, the political dialogues with participation of stakeholders based on wish and attitude of the ethnics must be held in designated places of armed ethnic organizations. So, I would like to say that the agreement is more meaningful than the word of ceasefire. Moreover, the NCA includes the facts how ways and means will be practised in detailed implementation of abiding by the disciplines and enjoying rights. The Union based on democracy and federal system which not only today’s armed ethnic organizations but also other ethnic organizations demand has been agreed in the first basic principle of the NCA. In this regard, somebody ask about the type of federal system. The first basic principle guaranteed “the Union based on democracy and federal system with full rights and guarantees of democracy, national equality and self-administration.” It is the federal system that all our national people wish or the Union system. It is the aim for the federal Union and rights for all national people. To have this aim and rights, what do we adhere to? We must adhere to three Universal Truths-liberty, equality and justice. And then, it needs to adhere to Our Three National Causes for serving interest of the Myanmar nationals. A point of the agreement mentions “it needs to build the process for responsibilities, rights and aims in detail in line with the result of political dialogue” which is a democratic peace method called the negotiation way. All armed ethnic organizations must sign the NCA. Some organizations said it does not need to sign the NCA because there is no firing and attacks. In fact, the NCA means an agreement of ceasefire. Actually, its essence is wider and deeper. So, I firmly ask you to sign the NCA. No provision in this agreement limits or restricts the rights of people, but provide every possible right for them. It is therefore fair to assume that continued ignoring of this fact amounts to resisting the federal Union which people aspire to, opposing democracy, having desire for armed ‘anarchy’, and disregarding the interests of the Union and its people. We need to go in line with law in building a Union based on democracy and federal system. And rule of law is also necessary to build such a Union we aspire to. There are different views about the rule of law. Legal scholars focus on stability to determine the rule of law. And from political point of view, there are two important factors-‘accountability’ and ‘no one above the law’-to determine the rule of law. Without these two, rule of law cannot exist, it is assumed. Therefore, we need to abide by the existing laws of the country in building a Union based on democracy and federal system. And we need to respect and adhere to common agreements. At the same time, there is a need to strengthen political and security stability. It can be assumed that revolution is complete when the old structure is demolished, but building is renovating and maintaining the old structure and building the new things. We should be aware that it is building rather than revolution that is being practised in the world today. all groups to take a broader look at the NCA, which absolutely guarantees the rights of national brethren, rather than viewing it as a mere ceasefire framework, and participate without hesitation. every citizen to accept and believe in multi-party democracy system, which is the wish of the people, and practise and abide by all democratization works in line with law. to proceed with justice, freedom and equality in building a democratic federal Union, which is the hope and wish of people, while safeguarding Our Three Main National Causes-our national interests.